Never stop dreaming. 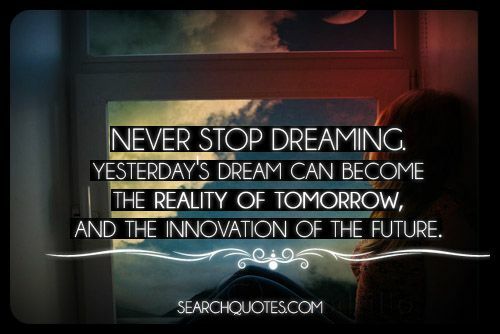 Yesterday's dream can become the reality of tomorrow, and the innovation of the future. When we dedicate our lives to following what is in our hearts to do, we dedicate our lives to living out our dreams. When a person is unable to dream their whole lives or unable to go after any of the dreams that they may have in life, a person is essentially dying from the inside to the outside. We must never stop believing in our dreams, no matter what life is willing to throw at us, and we must also realize that simply following our dream is a dream in itself since most are too afraid to do so. Dreaming may be dangerous, but with no risks taken in our lives is a life left with no reward. Never doubt your dreams, pursue them with the most vigorous intensity and fight, and eventually you will reach your destiny. Not everyone's life is a dream, but those who live life dream-less, are those who live life "lifeless."